Brazilians angered at the 48-hour suspension by a court of the WhatsApp messaging application have been taking to social media. A judge ordered that access to the popular messaging application be blocked in Brazil for two days from Thursday for its failure to comply with a court order. Brazilian media reported that the judge wanted WhatsApp to provide investigators with access to the WhatsApp conversation of a suspect in a criminal case. Brazilians have been expressing their surprise at the suspension and have been joking about how they would spend the next two days without access to the popular messaging service. 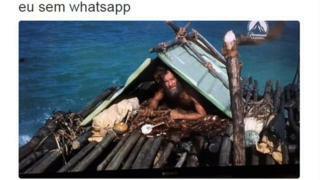 A user calling himself simply idiota (idiot) (@euidiotices) made it clear he felt adrift without WhatsApp when he posted the above picture and the sentence: "Me without whatsapp". He was not the only one to make the connection to the popular film Cast Away. Karina Ribeiro (@karinaribeiro72) said she would exchange some ideas with Wilson, the volleyball Tom Hanks' character starts speaking to while stranded on the deserted island. Many others shared what they would do with their newfound time under the hashtag #Nessas48HorasEuVou (#Inthese48hoursIwill), which quickly began to trend. While many of the users said they would pass the time by watching box sets of popular TV shows such as The Walking Dead and Supergirl, some seemed to have forgotten what a TV was. Luis Mariz (@LuisMariz) tweeted: "#Inthese48hoursIwill we have a picture at home here that has people talking inside, I'm told it's called TV, does your home have one?" Others wanted to use the outage to socialise with friends face to face...or even get to know their relatives better, such as user Luanete LS. Some WhatsApp users clearly feel they have lost touch with their closest ones to a sometimes worrying degree, such as Brenda who said she would use the time to "find out who those strange people in my house are. Some promised to use the time to read books they have so far struggled to finish or to simply watch the sun rise over Rio de Janeiro. Many also want to return to the days before mobile communication and spend the next two days visiting people and "hugging them". A thought shared by Rafaa (@rafa_dalri)...or not when she tweeted: "#Inthese48hoursI will have a social life. Just kidding, there's still Twitter".